As opposed to being one of those “where is that brand now?” stories, Georgia-Pacific had a simple ask: Get Brawny back on track with an inherent truth that would drive into culture and increase sales. So rather than treating Brawny towels like a typical household cleaning CPG assignment, we sought the bigger truth when it comes to spills and messes: That our customers are much bigger than their messes. 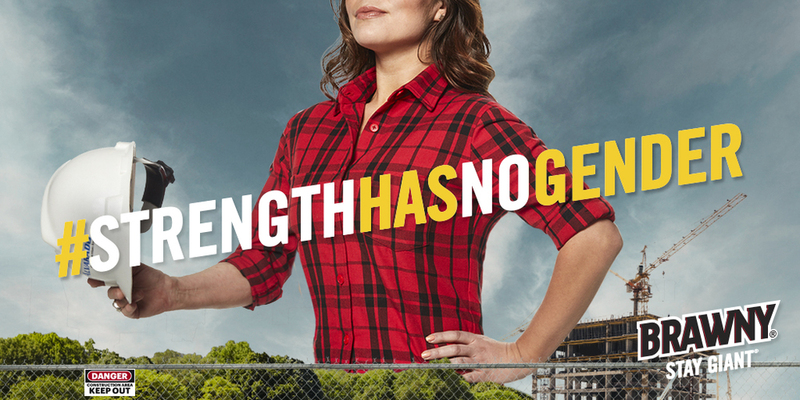 After the launch of the Stay Giant campaign, Brawny was looking for viral social ideas. We tapped into cultural topics that laddered to the brand purpose of strength and resilience and wanted to take a stand against gender bias issues and came up with the the insight that Strength Has No Gender. The campaign launched during Women's History Month and International Women's Day in 2016. We saw such great success that we brought it back the following year. 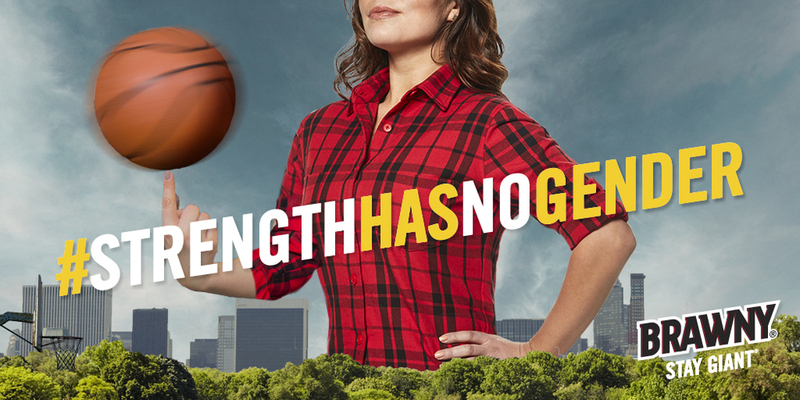 This time the iconic Brawny Man stepped aside and Brawny featured a woman on the pack. 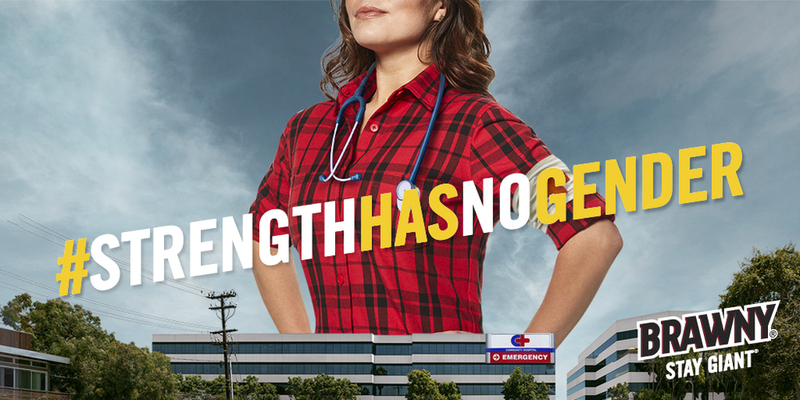 Coming off the success of Strength Has No Gender, Brawny wanted to do another viral activation during the summer that focused on patriotism. We leaned into the idea that the American spirit centers around the can-do spirit powered by strength and resilience. Because it's not AmerICAN'T, it's AmerICAN. There aren't bigger giants in our lives than moms. So, for Mother's day, we created a spot that showcased how moms are the giants in our lives from the child's perspective. We used the new Snapchat Spectacles to create a unique and interesting visual spin. Brawny was the first brand to use Snap technology in this way. 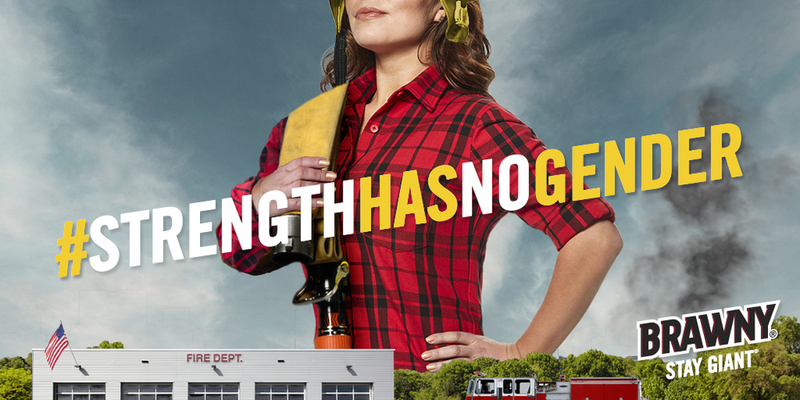 On social, we've brought the Brawny brand purpose to life by highlighting individuals who are giants in their own communities. We know video does well in Facebook, so we wanted to create a film series that highlighted the giants living among us every day. We found a way to create low budget films that feature a range of people including: a girl who collects coats every winter for the homeless, a barber who provides haircuts for special needs kids, a 70-year-old women who fought back after a knee injury to become an Ironwoman, and a mentor for inner-city kids.